If walls could speak, then the huge painted edifice at the UP College of Fine Arts is a wall that shouts with righteous fury. Painted on its surface is that of an iron-gloved President Rodrigo Duterte, offering the Philippines to America and China on a silver platter. However, America doesn’t want to share the plate with China. On its sides are ubiquitous issues that confront our society: the bomb-ravaged city of Marawi, jeepney phase-out and Duterte’s tax reform law. administration itself, with its authoritarian tendencies looming over society. The mural was initiated by organizations UGATLahi Artist Collective, Artists Circle Fraternity and Alay Sining with the support of the UP College of Fine Arts Student Council. Faculty members of the college also donated materials for the mural. The mural’s title is Pulutan ng Dayuhan. Roughly translated, it means Foreigner’s Appetizer. Pulutan is served traditionally served as appetizer during Filipino drinking sessions. According to UGATLahi- UP Chairman Luigi Almuena, the painting was a response to Duterte’s true character. “Pasista at papet si Duterte, lumabas ang kanyang tunay na ugali. Hindi na siya nagkukunwaring maka-kaliwa. Mas pinapaburan niya ang mga dayuhang makapangyarihan kaysa mga mamamayan, ” said Almuena. [Duterte is a fascist and a puppet. He has exposed his true character. He no longer pretends to be leftist. He favors foreign powers over his own people]. administrasyon ni Duterte,” said UP College of Fine Arts Vice-Chairperson Jeune Aramburo. The Freedom Wall is a strategic spot because it could be seen by a wide range of people: UP students and faculty, jeepney passengers traveling along the UP-Ikot route and residents of nearby communities such as Krus na Ligas and Village A. UP activists earned the ire of President Duterte when students walked out of their classes and held protests on February 1. He threatened to give the rallying UP students’ slots to indigenous people. However, artists such as Luigi Almuena remain unfazed by such threats. “Hangga’t may mali sa lipunan, hangga’t naririyan ang banta ng diktadurya, hangga’t tuta si Duterte sa mga imperyalista, hindi kami titigil sa paglikha ng sining na pupukaw at nagmumulat sa mamamayan,” said Almuena. Long recognized as a bastion of student activism, the University of the Philippines has always been associated with the protest movement. After all, it is the birthplace of radical student organizations Student Cultural Association of the Philippines, which later on evolved into Kabataang Makabayan. The activists of UP Diliman stood against dictatorship during the reign of Marcos’ Martial Law, and not a few have offered their lives. 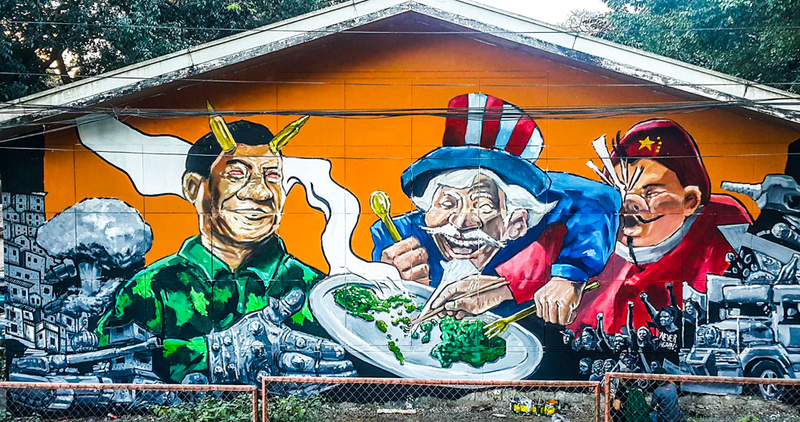 With Duterte’s rising dictatorship, the artists of UP Diliman remain true to their militant roots, and the mural is but one response of a series of artworks already created by its students. Last year alone, the members of UGATLahi in UP Diliman were involved with the creation of the “Rody’s Cube” the and “Trump Fidget Spinner” effigy. The group plans to create more art in different forms. In the near future, UGATLahi will launch a zine with anti-fascism as its central theme.